More sound vehicles are needed for the Langley-based Cars for Moms program run by Church in the Valley. April Davie admittedly feared losing her new job because her car was unreliable and she couldn’t afford the needed repairs. That’s when a pair of “angels” by the name of Ron and Peggy Bergen, called her out of the blue and gave her hope. Then, on Wednesday afternoon, they answered her prayers, handing her the keys to a new car – at least new to her – and one that promises safety, stability, and functionality for herself and her 14-year-old daughter, Julia. Davie is the latest recipients in the Cars for Moms program operated by Langley’s Church in the Valley’s Acts of Kindness ministry. Ron Bergen first met Davie last month, during the AOK’s twice-annual single moms oil changes – where struggling parents who qualify can get a free oil change, fluid top ups, vehicle once-overs, and manicures (for them, not the cars). One look at Davie’s dilapidated 2000 Buick Regal, and Bergen knew he had to nominate this woman for the church’s car program – and soon. “There was a lot of stuff that needed work. Too much, in fact,” Davie said. “It was in a sad state of repair,” she elaborated. It needed a new transmission and brakes, as well as having a broken window – and probably some other critical issues she wasn’t even aware of. Commuting back and forth from her home in Abbotsford to work in Newton several times a week, she feared the vehicle wasn’t going to make it – especially with winter coming. 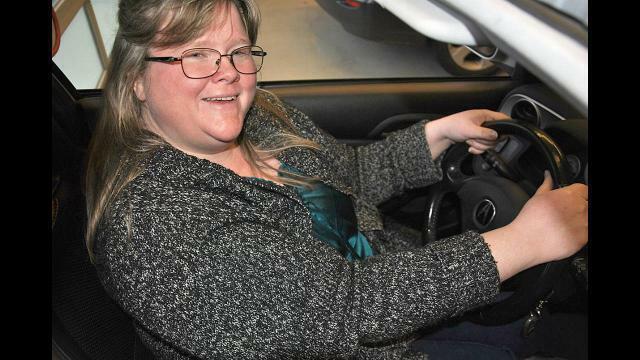 Sitting inside her new 2002 Accura for the first time Wednesday, she admitted to feeling relieved and elated. Davie started it up, rolled down the windows – just because she could– ran her hand over the upholstery and all the buttons, and even tried the sun roof. The AOK ministry accepts donations of older vehicles in good operating order that can be fixed up in the church’s mechanics shop and then gifted to single moms in need of sound transportation. While Ron takes care of the mechanical aspects of the program and fixing up vehicles before they’re given to the needy families, it is his wife, Peggy, who works with the church administration to review and accept applicants and processing potential donors. Donations of vehicles to the single mom car program are greatly accepted, said Peggy, noting donation-in-kind tax receipts are available. While they have accepted some questionable vehicles that ultimately ended up going to the scrap yard – that earned them credit for parts later – Peggy emphasized that they are looking for vehicles in good operating order. They need ones, that with some basic repairs and maintenance, can provide safe and reliable transportation for a single mother for several years to come. “If the car is fit… a relatively newer car… it’s a win-win situation for everybody,” she said. The Seventh-day Adventist church’s lead pastor Dave Jamieson suggested local residents rethink trading in those older vehicles. “Really make a difference in someone’s life… You might trade your vehicle in and they’ll give you $500 or a $1,000 and it’s done. You can donate it to AOK’s Cars for Moms program. We can repair it, and maybe a single mom can drive that car for five, six years. It will pay it forward in a huge way to a family in need,” Jamieson said. The response to the program during its four-year history has been “remarkable,” said Peggy. “The flood gates have opened,” on both ends, she said. In the past four years there have been 30 vehicles given out through the Cars for Moms program. She noted the demand continues to climb, with requests coming in as many as two a month, more recently. “People just catch the fire. They think it’s such a wonderful program. It’s sort of one that probably gets missed,” but the need is great, Peggy added, noting a high percentage of marriages that don’t work leave single moms facing tough socio-economic issues. That often means finding and securing a reliable vehicle is impossible. But the Cars for Mom program is offering an option in dire cases. For those interested in donating a sound vehicle to the program, they can all the church at 604-514-8335 or visit their website at churchinthevalley.ca.